Surgery is a Big Deal! When it comes to choosing the right surgeon to perform your spine surgery, taking the time to compare which options are the best for you could be the difference between successful surgery or more pain. 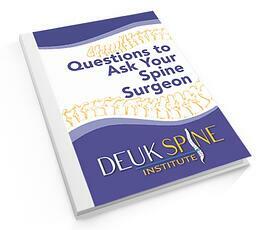 At Deuk Spine Institute we understand that you may not always know what questions to ask. That's why we put together this simple guide for you. This guide has 10 important questions you need to ask when looking for a spine surgeon. What is the probability I will need another surgery? What is the surgeon's success rate? Download your copy by filling out the form to the right!